1157 dual filament bulb. Mounts with offset base pins. 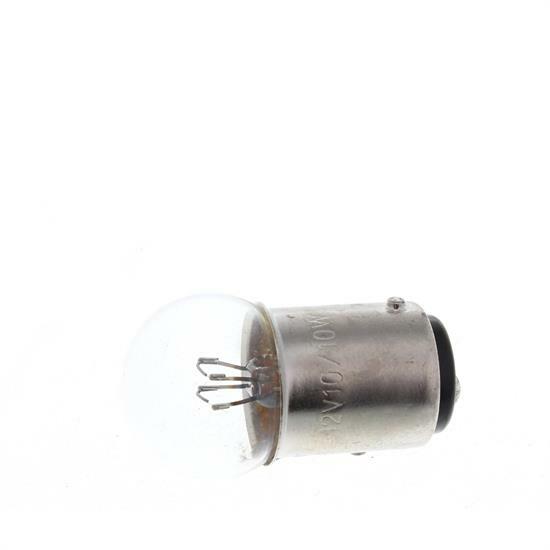 Compact dual filament tail light bulb with 1157 style base (with offset pins). Same function as a 1157 bulb, but with a smaller bulb. Universal replacement bulb for tail light applications. Measures 1-1/2" from bottom to the top. Works as a replacement bulb for accessory lights 316-0175 and 316-0176. Our side mirrors with LED turn signals are a quick upgrade you can make to your car to set it apart. Speedway Motors employee Pat O. talks about the King Bee Headlight and a few conduit options available at Speedway Motors. Pat shows the difference between Incandescent, HID, LED Headlights. Welcome back to the Vulcan Project! Product guru Jeff K. continues to execute his plans to bring a 2004 Kawasaki Vulcan back from the brink, this time working over the lighting system. Speedway Motors employee Jason L. talks about the many uses of the Model A Taillight we offer. They aren't just for Models A's anymore! Speedway Motors Product Manager Jeff K. not only has an awesome 1946 Ford Sedan Delivery, he has a Mullins trailer that he restyled to match "Elmer". Jeff took the time to write up what he went through to make the style of the Mullins match up better.